For the Sega System 18 arcade game, see Michael Jackson's Moonwalker (System 18). Michael Jackson's Moonwalker (マイケルジャクソンズ ムーンウォーカー) is the name of one of two video game tie-ins made by Sega based on the 1988 film, Moonwalker. The other is an arcade version produced for Sega System 18 hardware, and a third (sometimes subtitled as The Computer Game) was released by U.S. Gold for home computers, but had no involvement from Sega. As the name suggests it is endorsed by pop sensation Michael Jackson, who would go on to have a long history working with Sega. Moonwalker is made up of a number of short films and does not tell a coherent story from beginning to end. As a result, all versions of Michael Jackson's Moonwalker are based on one segment of the film, Smooth Criminal, which sees Jackson using various music and dance related abilities on a quest to save kidnapped children from the hands of the evil "Mr. Big" and various American gangsters. 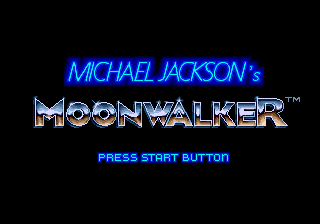 Console versions of Moonwalker play similarly to their arcade counterpart, but are played from a 2D perspective. As with the arcade version the objective is to go around destroying enemies while finding the missing children. / jumps, /pressing kicks, and /holding spins/shoots your hat at enemies. Music is shortened in this version. This version is notable for having several pointless features which do not appear to have much effect on gameplay (for example, + / moonwalks and it is also possible to do crotch grabs). opens doors and sewer lids. Once all the children in a level are saved, Bubbles the Monkey will appear and will point you in the direction of Mr. Big, and once you get to the right spot you will have to fight a barrage of his cronies to complete the stage. The Master System version cuts the Bubbles scene and goes right to the boss barrage. If a meteor falls out of the sky, catch it to turn into a giant mech that shoots lasers and is invincible for a short period of time. You cannot rescue children while invincible. In the early days of the Mega Drive, Moonwalker was often used as a flagship product of Sega's system (particularly in North America), with Jackson's persona being used along with many other celebrities in an effort to put a dent in sales of Nintendo products. Even though both versions of the game have a stage takes place in a graveyard and have the "Thriller dance" which can be performed, the theme of Thriller does not feature in either game (being replaced with Another Part of Me). It is suspected that the reason for this was that Michael did not write the song (Rod Temperton wrote Thriller for Michael). However, in the first revision (REV 00), excerpts of Thriller are used for the dance attacks in the Round 3 stages. The Sega versions of Moonwalker have now achieved cult status and are remembered for being a memorable point in Jackson's career, marking a change in stage personas between the albums "Thriller" and "Bad". Jackson would work with Sega on several future products - he would be responsible for much of the music in Sonic the Hedgehog 3 (though remains uncredited) and features in both Space Channel 5 and Space Channel 5: Part 2. A sequel was planned but later dropped due to child molestation accusations to Michael Jackson in 1993. Main article: Michael Jackson's Moonwalker/Magazine articles. Main article: Michael Jackson's Moonwalker/Promotional material.